Students work in a variety of H&HS units including Dining, On-Campus Housing, UCLA Catering, University Apartments, the Student Technology Center, and the Hospitality Sales and Marketing groups. Please note that only undergraduate and graduate UCLA students (both work study and non-work study) are eligible for all H&HS student positions. UCLA Extension Students are not eligible, but may email hospitalityjobs@ha.ucla.edu for other opportunities. H&HS Student team members may also apply for the Student Hospitality Leadership Development Program (SHLDP), which helps expand their knowledge of the many departments within the H&HS Division, with a strong focus on hospitality. 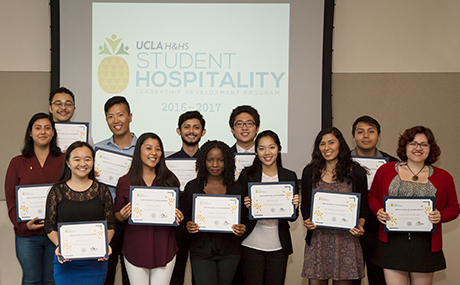 The goal of the program is to increase student team member engagement with H&HS, as well as to make participants aware of potential hospitality careers at UCLA and beyond. Email completed application along with your resumé to Andrew Hattala at hospitalityjobs@ha.ucla.edu. For questions, please contact Andrew Hattala at (310) 825-5951 or hospitalityjobs@ha.ucla.edu. PLEASE NOTE: Macintosh users should use Adobe Reader to edit and save the application so it can be printed once returned.